Pin it to your SIDE DISHES board to SAVE it for later! Follow The Slim Kitchen on Pinterest for more great recipes & tips! These delicious mushrooms are perfect on steaks, burgers or even chicken! They are super easy to make and add an irresistible savory flavor to any dish! If you are cooking these on the stovetop, you’re going to want to make sure you keep the heat up fairly high and don’t stir them too much. This will allow them to get a nice golden caramelization adding tons of delicious flavor! 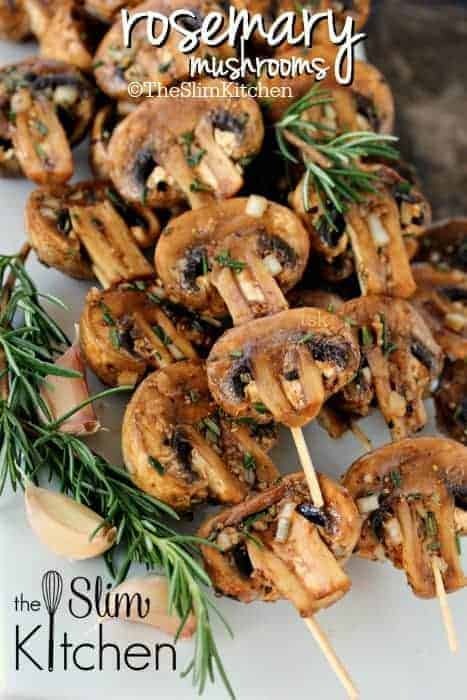 Delicious savory mushrooms grilled with rosemary & garlic! If using wooden skewers, soak in water 30 minutes. Wash mushrooms and cut in half. Combine in a Ziploc bag with remaining ingredients and allow to marinate 15-20 minutes. Preheat grill to medium high. Thread mushrooms onto skewers and grill 8-12 minutes turning occasionally. Note: These can be cooked on a stovetop. Preheat a non-stick skillet to medium-high. Add marinated mushrooms and cook (stirring infrequently) 6-8 minutes or until water is released and absorbed.